Creators of exclusive luxury gadgets, Feld and Volk are about to release the iPhone 6 Divine collection. Here’s a look at the elegant Ganesha and Buddha models from this Russian company’s latest collection. Feld and Volk create custom luxury mobile phones and their clients include global celebrities and eminent people in the world. Their latest collection is inspired by the East and brings to life the creative sketches of Ganesha and Buddha by Maria Lichtenfeld. The iPhone 6 Buddha is a modification of iPhone 6 128 GB. It is in black aluminium with 24K gold-plated buttons. 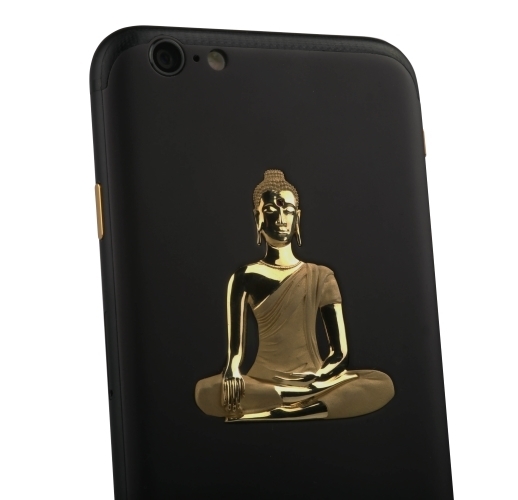 The canonical image of Buddha on its back is cast in 18K solid gold and then meticulously polished using two methods that blend the gloss and matte textures of the metal. The final 17-gram image of Buddha is no less that any precious jewellery. View the slideshow above for more on this Divine Collection. Tagged bespoke, Big Boys' Toys, LifeSpice, Luxury Phone, luxury smartphone. Bookmark the permalink.